Perfect for weddings, birthdays and events. 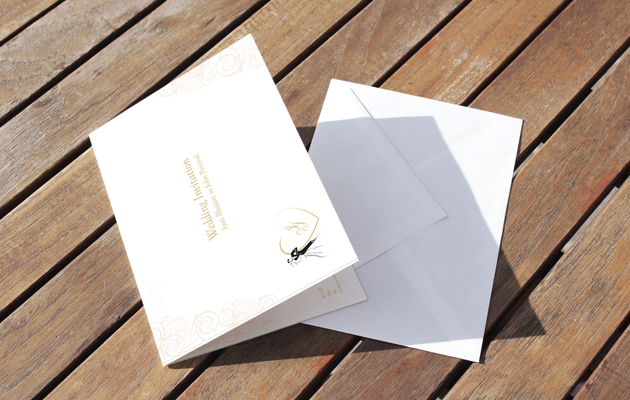 This folding card supplied with envelopes is a neat package with the print being in colour on a high grade 350gsm thick silk card. Add 20% to the price if you require gloss lamination (front side only). Artwork can be uploaded once the order has been placed and paid for. If you need us to design it for you please contact us on 020 8863 4411, email [email protected] We'd be happy to help and discuss many more aspects to help wth your event. Click on the price to checkout.